Day 1: KTM/Paro Transfer to hotel tiger nest resort, set in the pine trees in direct view of the most famous buddhist monastery in the himalayas. Day 02: PARO: visit the north parts of paro valley; the impressive drukgyel dzong ruins (monastery fortress); national museum, kichu lhakhang, and view paro rinpung dzong; overnight at hotel. Day 3: PARO/TAKTSANG/UYGENTSEMO: morning hike up to the taktsang retreat (the tiger's lair). lunch en route. continue above taktsang to the uygen tsemo monastery, on way to camp visit an ancient zangtopelri temple set in serene rocky surroundings over-looking the taktsang cliff below; camp at uygen tsemo is a unique experience- you are at the crown/head of taktsang- the latter being the body of guru rinpoche. camp overnight. Day 4: UYGENTSEMO/BUMDRA: continue uphill along the gorge- 4- hrs to bumdra monastery via yuser gang lhakhang, set in an open plateu at alt 3500 m with marvellous views of chomolhari, jichudrake, and the paro valley below; bumdra is lcoally known for several sacred sky burial (rocky spot, an hour walk above the moanstery) sometimes even practiced today for deceased infants; the main temple and several smaller lodgings used for meditation are also familiar grounds to the numerous wild pheasants that are used to humans. camp overnight by the monastery. Day 5: BUMDRA/PARO/THIMPHU: hike south along the ridge towards the main paro valley, 4-5 hrs with a pack lunch stop at one of several lhakhangs dotting the route; pick-up transport awaits to drive to thimphu, hotel. Day 6:THIMPHU: sightseeing of capital city- thimphu: visit the simtokha dzong- oldest fort in bhutan; the national library; and school of thanka painting and the traditional medicine institute; overnight in thimphu hotel. Day 7: THIMPHU/WANGDI & PUNAKHA/PARO: morning excuriosn drive on the mountain route towards the former capital of bhutan passing through the dochu la pass (alt. 10,000 feet); stunning scenery of himalayan ranges. 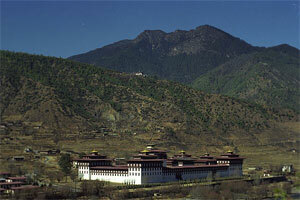 descend to punakha & tour the town. after picnic lunch by the wangdi river continue to wangdiphodrang dzong, the most picturesque in bhutan; return to paro, overnight at hotel. Day 8: PARO-DELHI/KTM: transfer to paro airport for onward flight to delhi/ ktm. The trek mentioned is of average difficulty, short but visits a nice part of paro, not visited by tourists; we had explored and discovered as part of a special package.